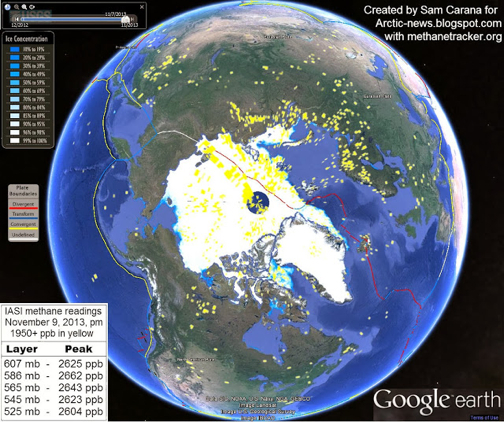 On Nov. 9, methane readings well over 2600 ppb were recorded at multiple altitudes, as illustrated by the image below. The trend is for rising levels, and the process appears to be accelerating. Many people do not even know that methane is minimally 20 times as powerful as carbon dioxide as a greenhouse gas. Global warming does change the climate, but the phrase "climate change" sounds more benign and obscures the cause of the effect. One must wonder about Business As Usual -- does it really have to break down or implode before we take a different path than ecocide? Good news: a vital part of the entire picture is being addressed by fundamentally changing how we run major sectors of what we can call the Pollution Economy. For too long this economy has been running amok. Maximizing fossil power has been the order of the day whether for transporting and travel, heating, or electricity. Picture civilization as we know it without fossil fuels -- hard, isn't it? Given the runaway greenhouse threat, conservation and restoration are the self-evident course. However, diehard players are saying to themselves, "Resource limits and ecological entropy be damned, let me get rich now and to hell with my descendants if they are somehow even born." On top of all too much evidence of folly, now we have "Typhoon Haiyan Influenced by Climate Change, Scientists Say" - Sydney Morning Herald. For a sailor like me, this is as disturbing as a forecast for more and wilder tornadoes for one living in the U.S. "Heartland." That's besides the point. The impression given by news media is that nations can start phasing in some greenhouse controls to have an effect for saving the climate as we know it (never mind the growth of consumer humans). But -- and the whole point is -- global warming is out of control due to positive feedback loops. Sail transport is on the rise, but there may be more dimensions to it than first meets the eye. 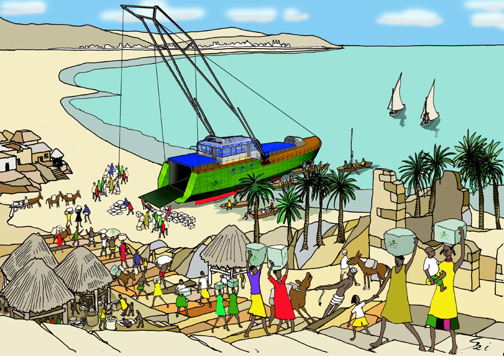 My first concept of it was for individual/family reliance on a sail boat kept at the mouth of a river, to be able to have access to communities near and far with nenewable-energy powered propulsion. 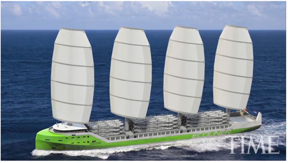 Many years later, by the time of the SAIL consortium meeting in Rotterdam last week, it was clear that great pains had gone into ascertaining the market context for a new hybrid windship, or "Ecoliner." Teams of Partners in SAIL are showing how the ship, in an increasingly unsettled world, should be able to compete with oil-burning cargo ships -- even without subsidies that the conventional fleet enjoys with its huge economies of scale and little pollution-control (so far). Not only this, the Ecoliner is being meticulously designed and tested for optimum efficiency from its many Dynarig sails and its auxiliary motor. It just takes about 20 million Euro to build one, launching what may turn out to be a large-scale, high-tech phase of sailing's long history. Here's an EU link to an overview of the North Sea's SAIL consortium: northsearegion.eu. One can take inspiration from this initiative, and furthermore borrow some publicly available knowledge to "clone" SAIL. The U.S., however, is led by the servants of growth of the Pollution Economy (the folks telling us we need more Fukushimas). So, until they catch on and allow a U.S. "race to the moon" for sail transport revival, look to other parts of the world. China is not only powerful, but acts fast for a planned economy state. All shipping on the water generates enough carbon dioxide as if the sector were the seventh largest country. Additionally, 16 (sixteen) cargo vessels today generate as much sulfur and other pollutants as all the world's cars. Ships spewing heavy bunker oil kill approximately 60,000 people a year through lung diseases. The U.S., formerly the world leader in environmental protection, has slacked off, such as by not affirming the international Law of the Sea. But another player, Russia under Putin, is proving to hold back progress on such matters as emission controls for ships. Although sail power cannot immediately offer great relief to the frying of the planet, it represents a vital piece of tomorrow's alternative to today's status quo, when the full implications and manifestations of sail transport are pursued -- and they will be. And today, sailing ships can offer low-cost, loosely reliable connectivity for small ports while protecting the ecosystem. Incentives for sailing, especially at large ports, have great potential, for example with International Maritime Organization rules coming into effect. 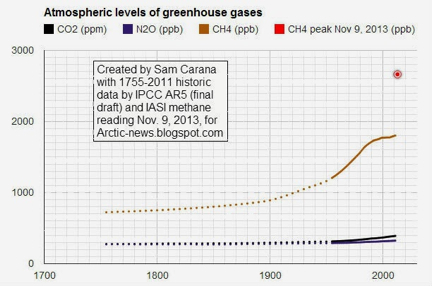 To keep in mind the urgency for the larger sea change, the chart below gives an idea of the height of the new methane emissions level in the Arctic, compared to historic levels, and how fast levels of methane (CH4) have been rising compared to levels of two other greenhouse gases, i.e. carbon dioxide (CO2) and nitrous oxide (N2O). It's easy to say that Ecoliners would be nice. But as the climate clock tickes, and convential oil extraction peaked several years ago, how many will be built while there are still financial and material resources? Meanwhile, there are countless lower-tech sail boats to put into operation for using clean, truly renewable energy for propulsion. They will be used. A long-term investment strategy for any smart, forward looking person with extra funds would be the purchase and restoration of sail boats. A grand gesture for posterity would be to write a check for an Ecoliner. Until the age of Ecoliners, if it comes about, there is urgency to begin thinking of almost all sail boats as utilitarian rather than weekend toys. 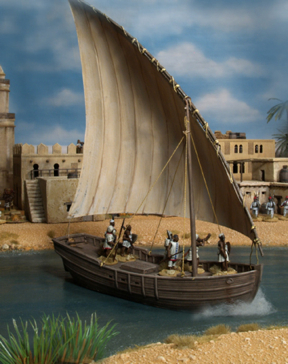 Pictured here is a felucca, at home in many countries. The lateen yard can serve as an oar on smaller rigs. These and countless other graceful, low-tech accomplishments on the water for simplicity are still a tradition, proving that sail is a marvel to be honored and enjoyed. And there's always more innovation, for young dare devils, such as kite sails attached to dinghies and ice vehicles, or an America's Cup using wing sails for that extra fraction of a knot in speed. Pictured below is the Tres Hombres, the 32-meter schooner brig owned by Fair Transport of the Netherlands. Engineless, it brings annual shipments of run, cacao and wine to pleasure-loving, hip consumers who don't like their purchasing goods to mean destruction of the climate. Yet, Fair Transport is behind the Ecoliner along with the EU SAIL consortium. So we have a double strategy, for offering both industrialized shipping and the natural, traditional way to have a sustainable world. There is another new kind of boat, much smaller but also thoroughly tailored, like the Ecoliner, for ease of trade in the relevant environment: Greenheart, shown here. The buzz will intensify; Al Jazeera has just reported on it. The vessel is now under construction in Bangladesh, and will be used as a quasi-amphibious cargo carrier for South Seas islands. That area is an unserved zone in large parts of it. With the added challenge of sea level rise that has already commenced, sailing (and paddling canoes as always) is how to work with nature rather than exploit and distort it. 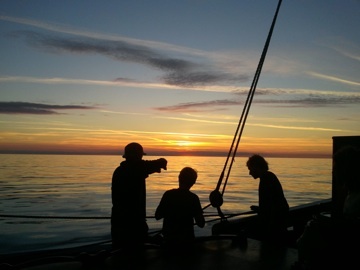 The Greenheart Project's prime mover is Gavin Allwright, who participated in the Rotterdam SAIL meeting. (A Sail Transport Network article on Greenheart is in preparation.) Greenheart could become the most heroic ship in modern memory. Below is a picture of Capt. 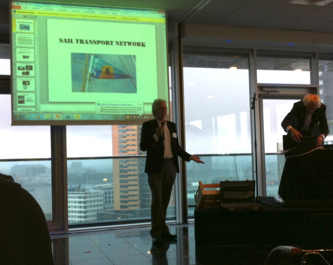 Jorne Langelaan giving the Fair Transport/Tres Hombres presentation in Rotterdam on Nov. 6, 2013 for the SAIL conference. He called for radical change, and was the most animated speaker of the entire two days. The slide shown reflects the two-track approach of ship types: Dynarig, traditional vessel. 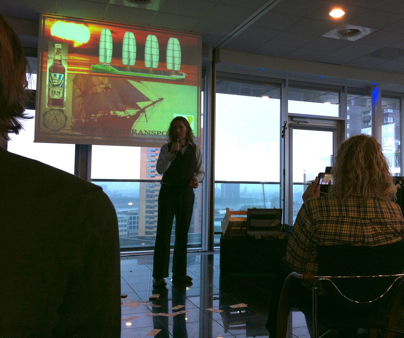 At the bottom is a picture of me giving my presentation in Rotterdam. I began with a little contest: "Whoever guesses the year Sail Transport Network was founded gets our burgee!" The winner was from Dykstra, the designer of Dynarig ships such as the Ecoliner. 1999 was the year. After running down STN's 14 year history and its members' exploits, I discussed in brief the vertically integrated oil industry. A key point is the issue of refinery balance for outputs, toward understanding the formidable notion of maximizing some desirable petroleum product(s) at the expense of others. LPG has been promoted as the "clean alternative shipping fuel of the future," when it is actually just petroleum. Jan Lundberg at SAIL Meeting, Sail Transport Network presentation. Burgee on screen. If we can maximize all options: traditional vessels, converting motor ships into sail rigs, and build new boats from scratch, we will be more prepared for the greenhouse world and possibly preclude its maximum. Of course, sailing alone won't save the world. But in conjunction with responsible land use, including biochar and hyper tree-planting, while radically curtailing consumption of the worst forms of energy, we may have a chance. One writer and speaker to ask is Albert Bates, permaculture teacher and author of The Biochar Solution. Like more and more leaders in sustainability, he keeps a lookout for more sail transport development. An across the board response for the individual to take action on global warming is the Pledge for Climate Protection, formed by Culture Change in 2000. Dope article! What source is the excerpt below? "All shipping on the water generates enough carbon dioxide as if the sector were the seventh largest country. " thanks and keep writing, your "I love nature so I sleep with her" post is an example of true sustainability. Very nice. You have to update your info concerning the global Methane emissions. It is a global emergency. Please look up the actual cience from the AMEG group. Then listen or read the latest on "Nature Bats Last".